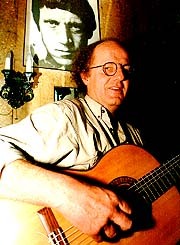 Jørn Simen Øverli translates and sings Vladimir Vysotsky's songs in Norwegian. He's also published few books about Vysotsky. Personal site of Jørn Simen Øverli  about Vysotsky, texts of translated songs etc. ; info about the author ans his other activities. It's an honor to sing Vysotsky's songs (PDF, 820KB)  interview with J.S. Øverli, in Russian (newspaper Russian Boulevard no.3, 2003). Series of pictures taken for the interview. Webmasters: please link to this page and not directly to the MP3 files (they can change location at any time). These CDs can be purchased from Kirkelig Kulturverksted on-line music shop. Text of all songs is included with the CDs. I can confirm that Jørn Simen sings the songs rather close to the original, both in style/intonation and in content translation. Most songs can be instantly identified by a Russian who doesnt know Norwegian at all. Øverli considers Han rakk ikke å elske to be his best song by Vysotsky in Norwegian. Vysotsky in Scandinavian countries  article. Audio records ©1989,1996 Kirkelig Kulturverksted.